The developers of MOBA game SMITE can hardly take a break and introduced the next god. This time, a guardian is on the program, which is not really part of the Japanese pantheon but nevertheless corresponds to the Japanese mythology: Kuzenbo. This god belongs to the devious creatures of the Kappa, a kind of mixture of lizards and turtles coming from the sea and pulling their his victims into the depths of the sea. On their heads, they carry a bowl filled with water and representing their power - whoever wanted to conquer a kappa, bowed to him courteously. When the Kappa has responded to this gesture, he has shed his water and lost a great deal of his strength. The most powerful of all Kappa is Kuzenbo. Let’s take a quick overview of his abilities. - The water bowl is its passive property. Whenever he suffers 2% of his HP damage, he gets a stack of 1.5% damage reduction, up to 10 times stackable for 10 seconds. Intercepted interruptions make it lose half of these stacks. - NeNe Kappa is his first ability to fire a smaller kappa in the straight line at the Kuzenbo, which bounces up to 2 times on walls and can travel a maximum distance of 70 meters. If an opposing god is hit, the NeNe kappa breaks out of his tank and attacks that god. - With Shell Spikes, Kuzenbo reflects some of the damage done back to the attacker. Each damage taken during this ability reduces the cooldown of NeNe Kappa. - With Sumo Slam, Kuzenbo storms forward, grabs the first enemy god and pushes him further. The first target is silenced and suffers damage when it collides with other gods (which also suffer damage) or is pressed against a wall. 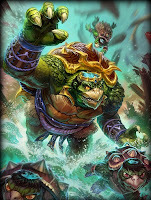 - The Ultimate Watery Grave lets Kuzenbo retreat into his tank and spin wildly. It gains increased movement speed and deals damage to all nearby targets, while repulsing enemies every second. Only the first rebound causes full damage. With Kuzenbo, the Japanese team is now set up so that there is at least one of every kind of God - a Guardian, Mage, Hunter and Warrior. Kuzenbo is still on the test server. If there are no major problems, it will appear during the next week for the PC version of SMITE.